In the afternoon of January 27 at Hirara Government Office Building of Miyakojima City Hall, Mamoru-kun (right) and Maruko-chan (left) were registered as special residents. A ceremony to issue their resident cards was held at the Hirara Government Office Building in Miyakojima City Hall. 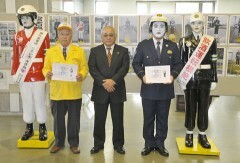 A real Mamoru-kun, Assistant Police Inspector Kazuhumi Ikema of the Traffic Division in the Miyakojima Police Station stepped in to act as Mamoru-kun, and the Chairman of the Traffic Safety Association in the Miyakojima Area, Toshio Miyazato, submitted the application forms to the Citizens’ Affairs Division of Miyakojima. City Mayor Toshihiko Shimoji duly accepted them and issued the special resident cards. Mamoru-kun is 20 years old and was born on August 5 in 1991. He keeps watch at 19 points on Miyakojima and Tarama. His sister Maruko-chan is 18 years old and was born on March 3 in 1993. She was unveiled last August. Their addresses were registered as the Miyakojima Police Station.